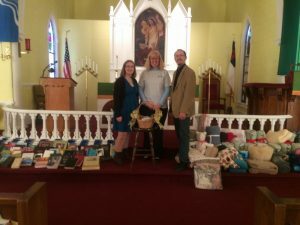 The Women of the NALC from St. Thomas Lutheran Church in Trufant, Michigan, held a Mission Sunday on Nov. 13 and collected Bibles and blankets for Hurricane Matthew relief. Mary Bates of NALC Disaster Response was their guest speaker for the Sunday morning service. Mary Bates of NALC Disaster Response (center) and Pastor Mathew Magera and his wife, Lane, with the Bibles, blankets and offerings collected to assist U.S. victims of Hurricane Matthew. NALC Disaster Response continues to collect gift cards from Lowe’s and Home Depot, Bibles, quilts, and new toys for Christmas for the more than 50,000 families in North Carolina impacted by Hurricane Matthew. Please note “Disaster Response Fund” on the check memo line. To volunteer to assist with disaster relief projects at any time in the coming months, email Mary Bates or call 740-509-1132.